Mount Baker is a stratovolcano that is estimated to be less than 140,000 years old, although its volcanic field formed more than one million years ago. It is composed of andesite lava flows and breccias. The mountain’s present form was initially developed before the Fraser Glaciation, which occurred between 25,000 and 10,000 years ago. 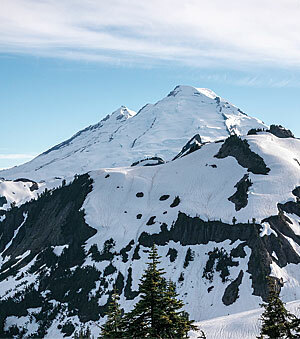 At 3,286 m (10, 781 ft), Mount Baker is the third-highest mountain in Washington State. After Mount St. Helens, it is the second most active thermal site in the Cascade Range. It is also the second most glaciated summit, following Mount Rainier. A major eruption occurred approximately 6,700 years ago, which included a flank collapse that formed significant lahars in the Nooksack and Baker Rivers drainages, accompanied by widespread ash and tephra fall. In March 1975, Sherman Crater, a crater located immediately south of the main summit, exhibited signs of renewed volcanic activity caused by magma intruding into the volcano. The increased activity included ash and steam releases; minor seismic activity; melting ice; and small, localized lahars. The mountain was closely monitored by the Cascades Volcano Observatory, as increased activity could threaten infrastructure and communities in the Nooksack and Skagit basins. In the following months, activity did not increase significantly. Over the following two years, activity declined and heat escape stabilized at a rate higher than in early 1975. It appears that magma intrusion decreased and that penetrating magma cooled to form a deep-seated dike. The Cascades Volcano Observatory continues to monitor Mount Baker, providing extensive baseline data for a rather typical Cascade volcanic event.